When I wore these pants to work the other day, my co-worker said, "Look at those pants!...Only you would wear those pants." She meant it in the nicest of sentiments and I smiled and laughed. I love them! The emerald green shade, the brocade and the pattern is so much fun. I wanted them to stand out when I wore them so I wore a black turtleneck and blazer to contrast against the green color. I couldn't resist wearing a hat with the chill in the air, so I wore this metallic beanie from H&M. I can see my next take on these pants with a simple t-shirt and flats to change things up. I truly cannot wait to wear these out again! Oh my gosh I love this look!! I am absolutely in love with those pants too! Incredible!! I love your pants! fabulous! The color and pattern on those pants is gorgeous. What a great find! These pants are absolutely gorgeous! 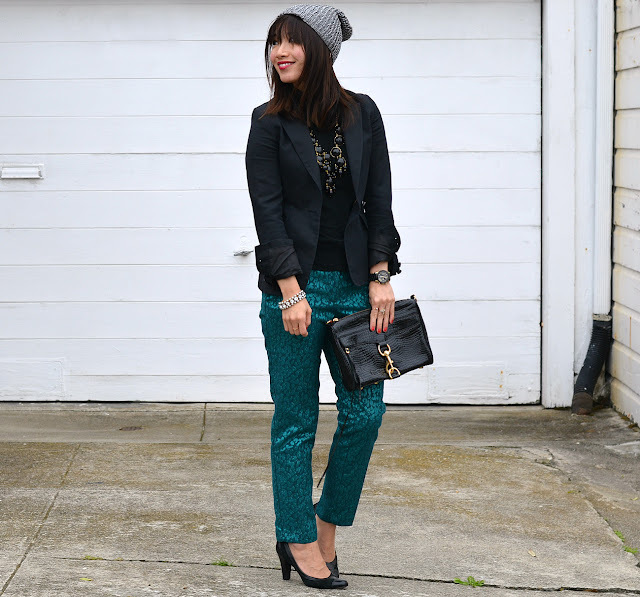 I love the pairing of all black to let the pants be the star of the outfit. LOL I get comments like that all the time! I love your pants! Those pants are gorgeous! The color is so rich! I'm in love with those amazing pants! OBSESSED with those pants!!!!!! Your entire outfit is adorbs!! I love these pants too! They are such a great statement piece. They look great paired with black! love those pants! I was eyeing the ones from Asos in green, but they sold out of my size :( Such a cozy look, love it! I love the whole look. 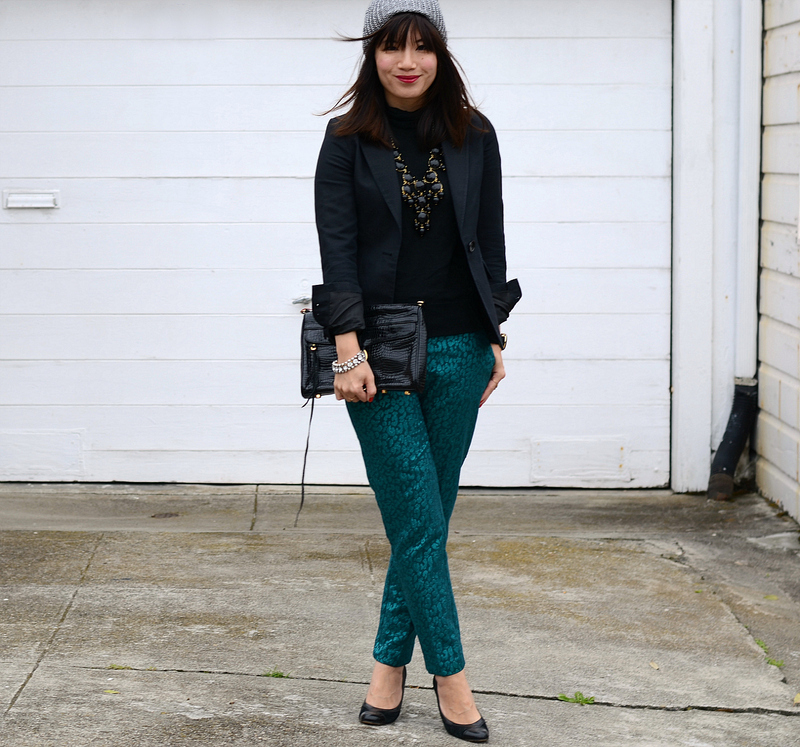 The color of the pants is gorgeous and I love how you accessorized the entire look. Love those statement pants :-) What a beautiful color! Those pants really stand out, in a stylish way. I love the dark, rich jewel tone and subtle pattern. Look great pairing with black the way you do it. I have spotted a few bloggers with different hats this season, make ne wanna get one too. I love those pants! They are gorgeous! Love how you dressed it own a bit with the beanie too. 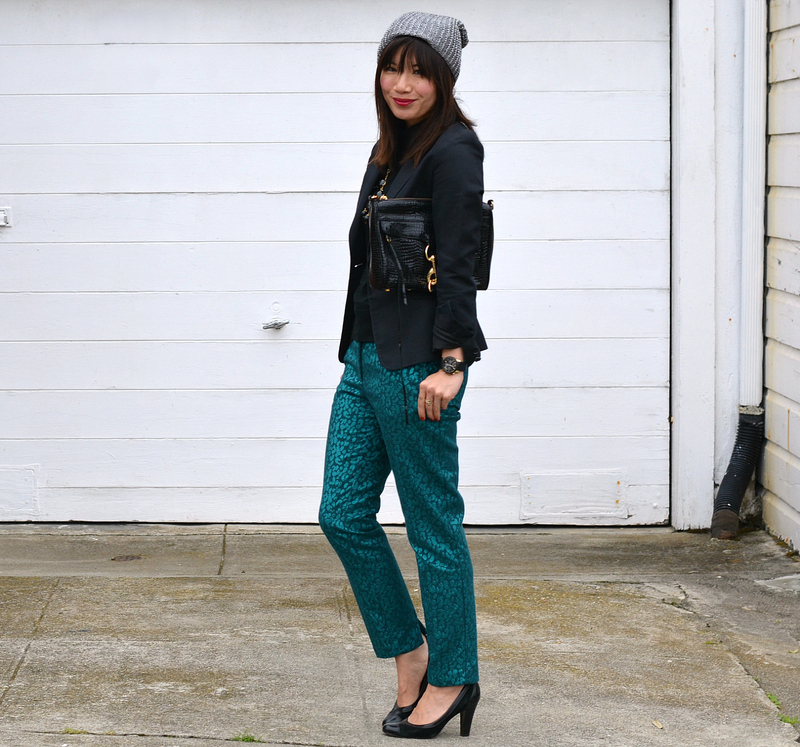 Those pants ARE so much fun - absolutely love them, and that hat looks SO cute on you! Love this entire look! That necklace with those pants are perfect. This color palette is very Fall/Winter! I love the deep and dark colors with a pop of teal! Ahhhh!! Come buy some pants for me?! I can never find any that are as flattering as these are on you! You look so gorgeous and that hue of emerald green on you is awesome. That's so funny that she said that, I get that all the time about different sparkly things I wear, LOL! It's going in my inspiration box!! Great pants! Love it paired with the black! I love those pants on you! Such a great colour. The whole outfit looks great. Lovely! I adore the pants and necklace. I'm definitely going to save this as inspiration. beautiful pants. the cropped length does make it versatile enough to wear with heels or flats! 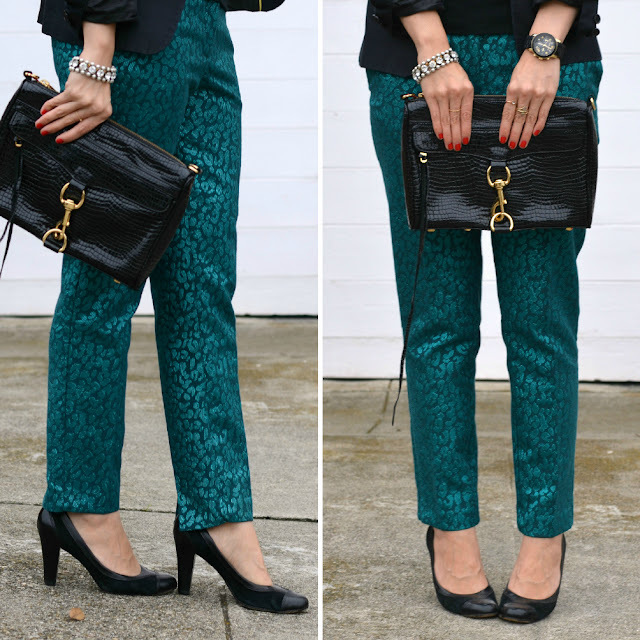 These brocade pants are fantastic! Love the Baroque trend, and you're really rocking it. And girl, you wear those pants well - I love the colour, and that you let them shine by toning down the rest of the outfit. YOu look damnn good! You're gorgeous and your style is amazing! Love the jewel tones of these pants....so great you mixed it with all black top & accessories!! those H&M pants are TO DIE FOR! You styled them perfectly and they just look amazing on your skintone. my eyes went straight to the pants! they are awesome! Super cute outfit! I love the pants and purse you paired with it. I love those pants! They really are gorgeous - the subtle pattern and green shade are so much fun. I hope they go on sale soon!! Those pants are gorgeous, and totally look fabulous on you! I have a similar Topshop pair, but I've packed on a few extra pounds and they don't fit. I can't wait to be able to wear them again!